From floating staircases to unique walkways, these homes know how to keep you on your toes. Take a look at how these seven homes are maximizing space by thoughtfully incorporating smart staircase design into their interiors and exteriors. The basic house has under-staircase storage, which is more practical, but less beautiful. Read more about this symmetrical Swedish residence here. The stairs and the wood paneling were designed and built by wood-worker Noah Israel, a longtime neighbor and friend. Read more about this mountaintop dwelling here. The rear facade is a complex articulation of angles and walkways. Read more about this cascading architectural wonder here. The top of the house is dedicated to a dining area and a kitchen outfitted with steel-topped cabinets from Sanwa Company. Read more about this dimensional three-storied Japanese home here. The wood-and-steel open staircase wends its way up three stories, supported by a concrete structural wall embedded with PVC tubes and bare lightbulbs. Read more about this 21st-century Argentine home here. Matthew Trzebiatowski matched an extreme aesthetic to an extreme climate, but his sustainable moves took a gentler approach. Read more about this eye-catching architecture here. 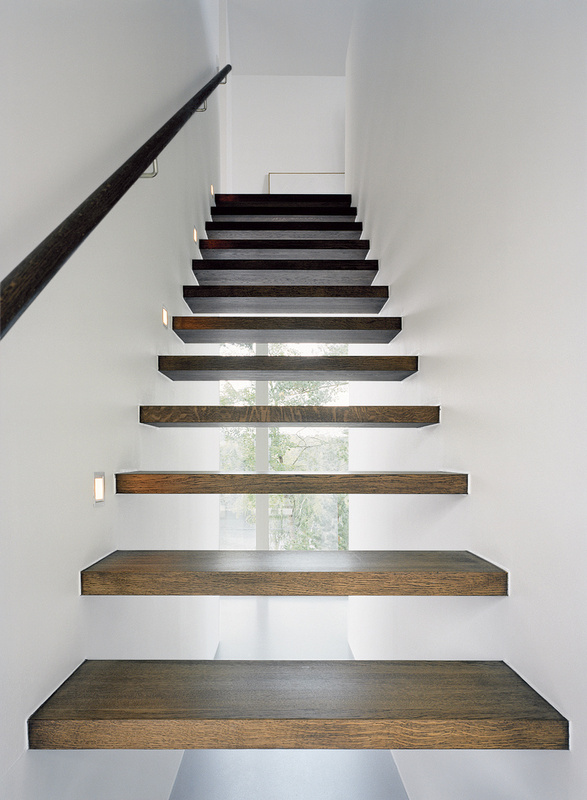 The "floating" staircase is actually supported by steel rods hidden within each step. Read more about this sustainable vertical loft here.